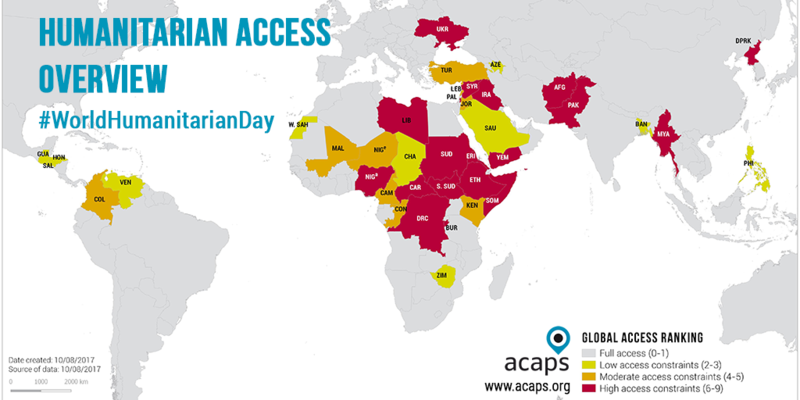 Geneva - To commemorate World Humanitarian Day ACAPS has produced a Humanitarian Access Overview world map highlighting 39 countries with data collected by our analysts as of August 2017. 39 countries are highlighted in this map according to three different levels of access constraints: low (11), moderate (9) and high (18). The highest access constraints are in Africa and the Middle East. The common access issues are related to the ‘Physical and Security Constraints’ of active hostiles and the presence of UXO and mines. A brief explanation of the access situation of each crisis can be found on a separate page. The methodology consists of nine indicators grouped in three categories that measure proxy indicators such as violence against personnel, denial of needs or active hostilities. Data has been collected at the country level and may therefore not show disparities between sub-regions. Learn more about ACAPS methodology. World Humanitarian Day is held every year on 19 August to pay tribute to aid workers who have risked and lost their lives in humanitarian service. The Day was designated by the General Assembly in 2008 to coincide with the date of the 2003 bombing of the UN headquarters in Baghdad, Iraq. Lars Peter Nissen, ACAPS Director, presenting the ACAPS Humanitarian Access Map at ICRC, Geneva, 18 September 2017. Humanitarian Access in Armed Conflicts, the Key Role of Local Actors. Event organised by HPG/ODI/ICRC.